The purpose of this article is to explore one aspect of the complex informational environment—advertising—in order to understand the messages used by advertisers promoting home mortgage products in the prime and subprime markets. 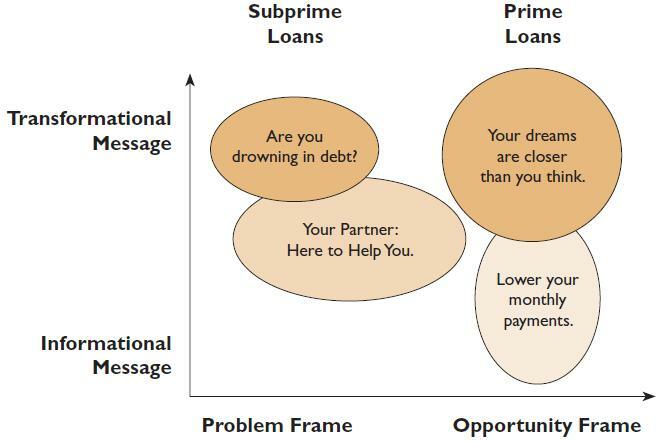 Subprime lending has been a longstanding public policy concern due to its impact on low-income, seniors, and other disadvantaged groups of consumers. Evidence suggests that subprime borrowers are less educated and less financially sophisticated than their prime market counterparts. Here we will discuss two kinds of ads. One school of thought is based on market competition and views ads as important sources of information about products and price. In contrast, adherents of the market power school of thought ads are more persuasive than informative, leading consumers to perceive artificial differences between brands, which results in lower price elasticity. These schools of thought are reflected by the informational and transformational content of ads. Informational ads present factual, relevant information that is immediately of obvious importance, and verifiable. A transformational ad builds an association between the brand and a psychological state. The selection of what dimension of the product should be highlighted in a message, can impact on recipients’ perceptions to the product. “Exactly what they say, how they say it, how big and bold things are titled, what they try it hide in the small print is important.” Consumers are easy to focus on the salience on a message and to generate the cognition. Then they relate the cognition to the conception held in their memory. “Media messages do not influence people; their major effect is to prime and reinforce existing attitudes.” Different saliencies resonate with different segments of consumers. It’s more effective to deliver a message when it’s relevant to target segment. 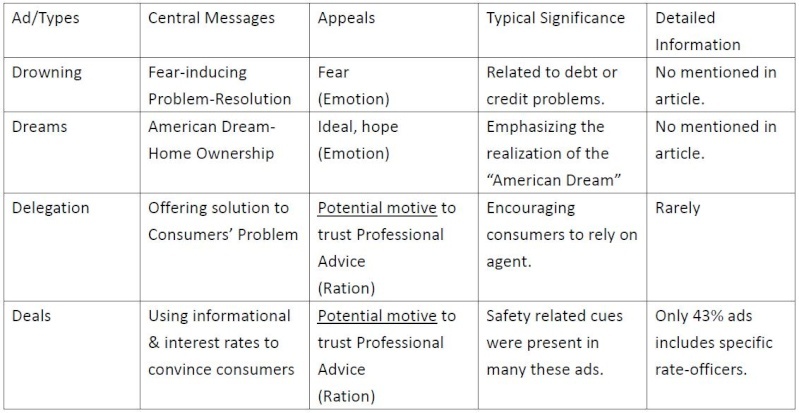 Dream ads gave consumers an image that the firm was to help them, the so-called American dream is a deep-rooted image in American society; Fear and negative image can draw much attention, that’s why drowning ads worked. The most important thing is that most consumers don’t understand much of the information disclosed about loan pricing, annual percentage rate, and only few of them knew the correct internal reference price, they trusted some incorrect, but seemed to be dependable extrinsic numbers. Where is the fine print? The ads analyzed included both intrinsic and extrinsic information. Intrinsic information is directly associated with the product, in this case loan terms such as interest rates. Extrinsic information is not directly associated with the product offered; rather it is information surrounding the product such as slogans. Many ads consisted only of extrinsic information. If the ad included intrinsic information it was in many cases unclear and non-specific. One reason for this is that the information is hard to provide in a visually attractive way. More specific information is often presented in a smaller font or in “fine print”. In cases when the information that is easiest to grasp works as a teaser, and more specific terms are presented in fine print, the intrinsic information is turned into extrinsic information. In general it is impossible, based on the content of the ads examined, for consumers to make price comparisons of different offerings. However, ads are just one source of information consumers can use. Other sources such as companies’ web-pages provide more clear information. The pressure is now bigger on lending institutions to provide more information that prevent consumers from taking bad decisions. There is an asymmetry in the information provided. In particular the information delivered through transformational ad messages. This asymmetry particularly affects subprime borrowers. Due to this problem, a rule for home mortgage loans has been approved by the Federal Reserve. The rule includes advertising and specifies what has to be included in an ad such as specific loan features and also bans misleading information from being used. However, the rule is not applicable to lending institutions not regulated by the Federal Reserve. Furthermore, the rule does not regulate the language used in ads. It is suggested in the article that there should be a standardization of the language and the information provided in the ads. In that way all ads could be made informative. Another reason that is mentioned to have contributed to the financial crisis occurrence is that lending institutions has not asked for important information from borrowers and information for example regarding incomes and employment has been exaggerated. This also caused an information asymmetry. It is concluded that correcting the information asymmetry would probably be in the best interest for all actors´.